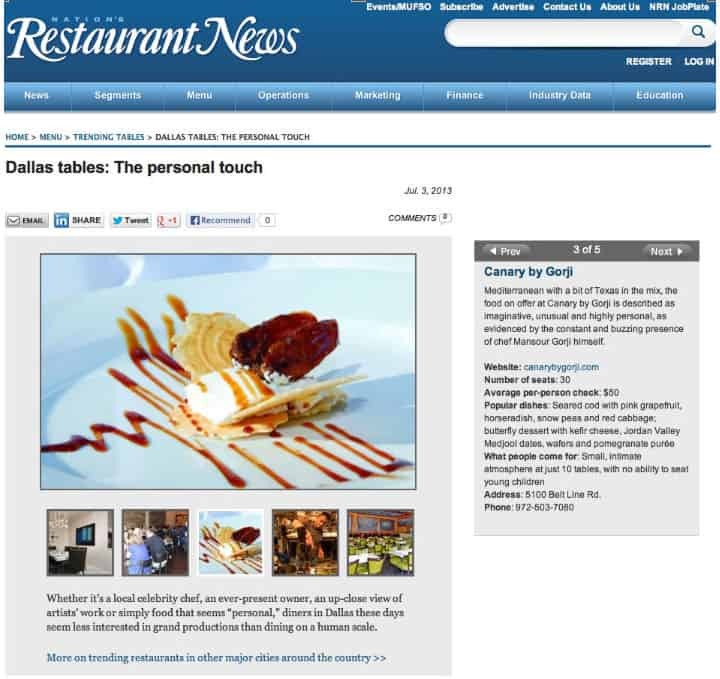 DALLAS – (August 7, 2013) –In the current Trending Tables report, a quarterly feature of “Nation’s Restaurant News,” Canary by Gorji was named among five Dallas restaurants that give diners a “personal touch”. 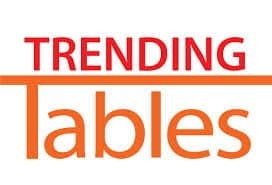 According to the publication, which surveys establishments in 10 top food cities across the country, the five restaurants featured have struck a chord with diners and are ones that research and development teams are likely to visit because they’re where the trends start. Gorji says the key to his longevity (the restaurant is 10 years old) is his customers’ embrace of culinary creativity such as his emphasis on using tart and tangy accents to highlight and enhance the natural flavor of food. This culinary philosophy is currently making news across the country. A recent report by American Public Media Marketplace Podcast reported on how chefs across the country are tickling diners’ tastebuds with fruits such as limes, lemons and grapefruit as well as greek yogurt and goat cheese. Dallas diners have already been enjoying this latest trend at Canary. Chef Gorji features dishes reflecting what he calls “Sour Power” such as “Striped Marlin with Grilled Rhubarb,” “Pink Grapefruit & Goat Cheese Salad” as well as his “Butterfly Dessert with Kefir Cheese” (Trending Tables chose this dessert in its report). And food critic Nancy Nichols of Dallas’ city magazine, “D,” says his filleted trout, served with white wine and lemon sauce is topped with tart barberries and capers…so clean; so naturally delicious.” Nichols also named the celery root salad with lime dressing as one of “The Top Twelve Bites I Put in My Mouth in 2012.” In a recent review, “The Dallas Morning News” critic Leslie Brenner also highlighted the use of citrus accents throughout the menu. Many of Gorji’s tart and tangy citrus recipes are featured in “Zing! By Gorji,” coming out this fall.To get on the mailing list for an advance copy of the new cookbook, email chefgorji@canarybygorji.com. Canary By Gorji is located at 5100 Belt Line Road Road, Suite 402, Dallas, Texas 75254. Canary By Gorji offers a boutique wine selection and is open for dinner Tuesday–Thursday, 5-9:30 p.m. and Friday – Saturday, 5-10:30 p.m. For more information about the restaurant call 972-503-7080 or visit www.canarybygorji.com. Chef Gorji’s own product line Gorji Gourmet Foods™, which includes Pomodoro and Puttanesca Pizza & Pasta Sauces, Dipping Oil & Marinade Primer and Pomegranate Vinaigrette are available for purchase at Canary by Gorji restaurant, DFW Whole Food Markets®, and specialty stores in the Dallas area: Jimmy’s Food Store, Bolsa Mercado and Celebration Market. The products are also available online at at www.artizone.com and www.gorjigourmetfoods.com. No Replies to "50 Hot Restaurants: Canary by Gorji Featured in National Trend Report"